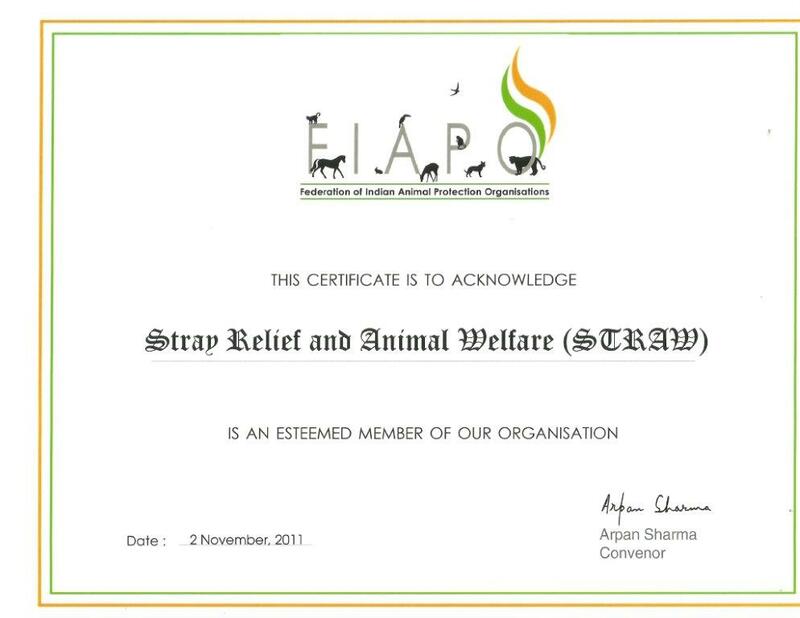 Located at New Delhi, India, STRAW is recognized and certified by the Animal Welfare Board of India (AWBI) and is a member of the Federation of Indian Animal Protection Organizations (FIAPO). It is also a former Member Society of the World Society for the Protection of Animals (WSPA), UK. The Indian Constitution in its Article 51A establishes that it is the duty of every citizen of India "To protect and improve the natural environment including forests, lakes, rivers, and wildlife, and to have compassion for living creatures". STRAW's vision is deeply rooted in this dictum. India has made significant economic growth during its post-independence era. Socially Indians have constantly risen to higher strata of the society. Yet we find a large portion of the population totally lacking the empathy, compassion and care which makes a society humane and civilized. Much of this is due to lack of awareness across large sections of Indian society. In such a situation, we believe that education can play a key role. It contributes not only to livelihood but also to nurture human sensibilities - to bring about a society that is humane and civilized; compassionate and considerate; caring and protective of not only one's family members and one another but also of all living creatures and the environment that we all share. STRAW India's vision is an extension of the above, wherein it envisions an India where where people treat each other with empathy, animals with compassion and care for the environment. We at STRAW strive to achieve this through the medium of humane education. STRAW India's mission is to sow the seeds of empathy for people, compassion for animals and care for the environment in the hearts of children, so as to prevent cruelty to all living beings. Compassionate Classrooms: By contributing humane education content for school textbooks and teachers’ manuals that are brought out by the various educational boards like the CBSE, so that humane education extends to the entire length and breadth of the country, in a fast-paced manner. Compassionate Youth: By bringing to light various animal welfare issues to the youth in colleges and professional institutes like the Indian Institute of Technology (IIT), Jawaharlal Nehru University (JNU), Lady Shriram College, etc. Compassionate Kids: By conducting humane education classes at various schools so that children become compassionate to animals and care for the environment. Workshops & Community Outreach Programs: By conducting humane education workshops, painting, essay writing competitions, nature walks and summer camps in schools; organizing awareness talks and presentations in colleges along with other community outreach programs at work places. Animal Helpline: By running a very active animal helpline that organizes rescue of animals in distress; counsels pet owners on a variety of pets and stray animal issues; helps in adoption of abandoned pets and other animal welfare activities. We believe that introducing humane education into the classrooms is one of the best approaches to bring about a change in children’s mindsets so that they grow up to be compassionate citizens of tomorrow. We believe that children have active, inquiring and absorbing minds and therefore are very receptive to important messages on how they can make a difference. We believe that children act as ambassadors of such messages, by spreading these within their family & friends and carrying such messages with them for the rest of their lives. Therefore, such humane education interventions have the potential to transform even the next generation. We believe that children act as ambassadors of such messages, by spreading these within their family & friends and carrying such messages with them for the rest of their lives. Therefore such humane education innervations have the potential to transform even the next generation. "Do not do unto others what you would not want them to do unto you" or in other words, "Always treat others as you wish to be treated yourself"